I’ve spent a few weeks trying to figure out how to write a review of 20TH CENTURY WOMEN. And after several attempts to wrap my head around this movie, I have determined that it is a futile effort. Here’s the premise. Annette Benning is a single mom of a 15-year-old boy. She works. She owns an old Victorian style home in late 1970’s Santa Barbara which she seems to be renovating. To help with expenses she has 2 borders. Greta Gerwig is a proto-punk photographer with fuschia hair. Billy Crudup is an aging Bohemian who knows how to fix cars, is helping with the renovations on the house and makes pottery. He’s the kind of guy who surfs in the morning even though he’s in his 40’s. Not judging. Just saying. Benning is having trouble relating to her son. I mean he’s 15, why would she? He has one very close friend, a beautiful girl who is a couple of years older played by Elle Fanning. So Benning decides she needs help raising her son played by Lucas Jade Zumann. Yeah, that won’t go too well. Not much happens in the movie. The characters move through life. They explore things like drugs, knowledge, creativity, love. But not much is resolved at the end. At least not in a completely or clearly defined fashion. The performances by Benning and Gerwig are really the highlights. Benning is so subtle. Everything you learn about here is in her reactions to things. Gerwig is more overt in her performance. You feel her sense of being somewhat “at sea” and her search for love and meaning in life through art and music. 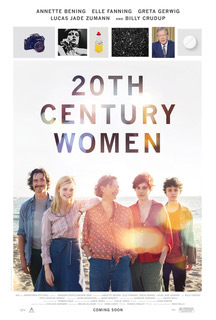 20TH CENTURY WOMEN isn’t a bad film. It’s ok. It’s just kind of confounding.